Building power with diaspora youth through artistic and cultural exploration. Through creative youth-led programming, Portland Meet Portland supports youth in discovering their identity and agency to become the new change-makers of their communities. Pass The Mic is Portland Meet Portland's free music education program for immigrant and refugee youth ages 14 and up. Pass the Mic provides youth with high-quality and culturally responsive music education and mentorship by experienced Portland musicians. Students will gain invaluable encouragement and experience in expressing themselves to their peers and their communities, and they’ll learn how to collaborate creatively with each other. Pass the Mic has two components: an after-school program in our Arts Center in the Gateway District, and a summer music camp held at Franklin High School. The theme of our spring 2019 after-school program is “Let’s Make an Album!” -- over 10 weeks, participating youth will make a collaborative album from start to finish. Click here and Donate to our Pass the Mic GoFundMe campaign! 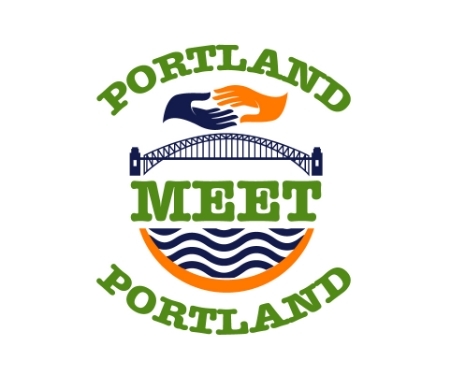 In the Lived Citizenship Program, Portland Meet Portland explores citizenship as a verb. Youth explore the meanings of belonging, exclusion, community, citizenship, and diversity in the United States as a cohort over the course of a year. They interview members of the New Columbia neighborhood, a public/private housing development with a mosaic of ethnicities and races, settled citizens, new citizens, those who aspire to be citizens, and those who are part of the community without being citizens. Youth are from refugee, immigrant, and 'mainstream' families, many of who have parents that have become citizens in recent years. Some live in families that have members that are vulnerable to deportation. These young people aspire not only to be good citizens themselves, but to be leaders. They are from low-income families and are truly motivated to create good futures for themselves, mentally, emotionally, financially. Under the direction of oral historian and teacher, Kay Reid, the youth meet regularly to hear guest speakers, study assigned readings, and turn in their written responses to speakers and reading/viewing assignments. What starts as meetings become classes in civic and cultural competency. Youth participate in the project in its evolving phases, which include interviews, transcription and editing of interviews, script-writing, production and presentations. After the cohort project is complete, we hold a public presentation as well as produce a final project booklet for the public to read. This booklet is called 'Stories from our Village'. In 2013, the Stories of Our Village project emerged as an opportunity to share stories of one of the most diverse communities in Portland = New Columbia. The mission of the story project was to capture in their own words a variety of voices from the New Columbia world. You can read one full Stories from Our Village right here.